The mission of Utah County Single Adults is to provide all single adults with opportunities for service, friend-shipping, temple worship, and strengthening faith in Christ. Utah County Single Adults (UCSA) is a program for Latter-day Saint single adults under Priesthood leadership with the direction of our Area Authority Seventy and a Coordinating Council of representatives from Latter-day Saint stakes and wards throughout Utah County. Church standards of dress and conduct apply at all activities and events. Divorces must be final. UCSA serves Single Adults ages 46+ as does Mount Timpanogos Singles (MTS). 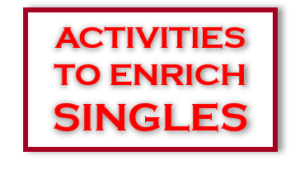 Single Adults ages 46 and up from all over the valley are invited to the activities of both these groups. Mid-Single Adults age 31-45 are also welcome to attend the UCSA activities.